Dan Aykroyd's affinity for travel has taken him around the globe. 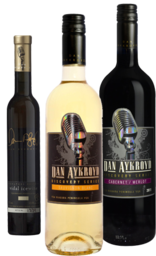 Whether visiting Asia, Europe, Africa, Australia or the Americas, Dan makes it a point to visit local wineries, talk to local winemakers and sample their wines. In his travels, Dan has uncovered some of the finest tasting wines each region has to offer. Inspired by the culture, passion and dedication for producing great wines, Dan has decided to team up with some of his favourite winemakers to create a series of regionally inspired and modestly priced wines that represent the best of each terroir.